In this book, Snyder succeeds in making zombies (both human and animal) wickedly funny--no matter how jaded you are by cries of 'Braaaaaaaaaaaains!!!' Either this book will make you laugh out loud at least once, or you should consider having yourself checked for signs of death. 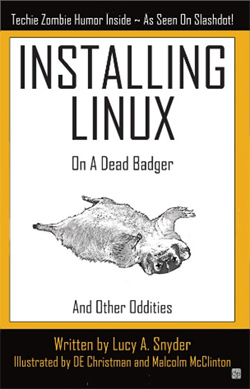 Snyder's work first came to my attention when the cover story, 'Installing Linux on a Dead Badger' was submitted to SFF webzine Strange Horizons, where I was then an articles editor. I can't take much credit for discovering her, though--there wasn't any debate in the articles team about whether we should publish Badger. It remains easily my favourite of the articles published during my year at SH. So it's a treat for me to see it appear in print, along with eleven companion stories that also explore ideas surrounding cybermancy, badgers, and the undead. Throughout the book, Snyder's style is light yet assured. She makes no effort to convince you of the validity of any of her claims, or to justify them, but just writes as if it's all true. 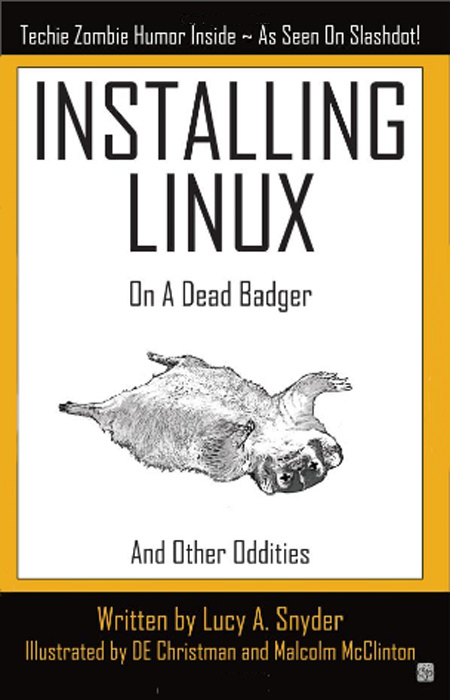 The effect is almost to convince you that it is true--that you, too, could install Linux on a badger. Or maybe a wombat. Or even an entire replacement workforce, with all the advantages and strange happenings that would bring. If only you had a Duppy card, and a herb-scented application. The focus on cyber-zombies does become a little too much at times, especially when one story contains virtually a re-run of the badger installation instructions, so my recommendation would be not to try to read this book at one sitting. Carry it with you--it's neither large nor heavy--and dip into it in a spare moment, on the train, or when you desperately need cheering up. You'll soon find yourself immersed in a whole other world, where vampirism is a career opportunity, and the best way to get an entry-level job is to pretend to be dead. The book is nicely-presented, and there are small gems everywhere--check out the product disclaimer on the back, for example--but for me the illustrations don't do it justice. They tend towards the grainy or the noticeably photo-shopped, although a notable exception can be found on page 73. It's a shame, as a lot of work has clearly gone into this book, but it might have worked better had the visuals been left to the reader's imagination. Overall, this book is a winner. It'll amuse you, entertain you, and inspire you to seek out more of Snyder's work, some of which--shameless plug--can be found in GUD. Lucy Snyder's poem Subtlety appears in GUD Issue 2 and her poem Internal Combustion is forthcoming in GUD Issue 5.